It means we have plenty of good, natural and wholesome ingredients for the family which is what this week’s book advocates. It’s Easy Mediterranean: 100 recipes for the world’s healthiest diet by Sue Quinn. The dishes (opposite) would make the perfect alfresco Sunday lunch, so give them a go tomorrow! Put all the marinade ingredients in a small bowl. Stir to combine, then set to one side. For the butterfly chicken, place the chicken on a chopping board, breast side sown, with the legs towards you. Using sharp kitchen scissors, cut along each sides of the parson’s nose, through the ribcage to the other end of the bird to remove the backbone. (Don’t throw the backbone away: reserve it for stock or freeze it until you’re ready to use it.) Turn the chicken over and press down with the heel of your hand to flatten it. Put the chicken in a non-metallic shallow bowl large enough for the bird to lay flat, pour over three-quarters of the marinade and massage all over. Turn the bird so the skin is on the bottom, cover with plastic wrap and chill in the fridge for several hours or overnight. Preheat the oven to 200°C/400°F/Gas Mark 6 and have two oven racks ready: one for the potatoes and another for the chicken. Put the potatoes in a roasting tin. Pour in the remaining marinade, toss to coat and place on the lower oven rack. Shake any excess marinade off the chicken and place the bird directly on the top oven rack, skin side up. Arrange the racks so that the chicken sits directly above and as close as possible to the tray of potatoes to catch the juices. Bake for 45 minutes or until the chicken juices run clear when you pierce the flesh with a knife between the thigh and the breast. Serve the chicken with the potatoes and the lemony pan juices spooned over each serving. First, make the pastry. Whisk together the flour, sugar, ground almonds, cinnamon and salt in a mixing bowl. Using the largest holes of a box grater, grate the butter into the flour mixture. Mix with a butter knife until you have lots of tiny bits of butter coated in flour. Add the egg yolks and mix these in with the knife, then gradually mix in enough of the iced water to make a dough that comes together into a ball without crumbling. Turn out onto a lightly floured work surface and briefly knead, then shape into a disc. Wrap in plastic wrap and chill for 30 minutes. While the dough is chilling, halve, stone and thinly slice the peaches, leaving the skin on. 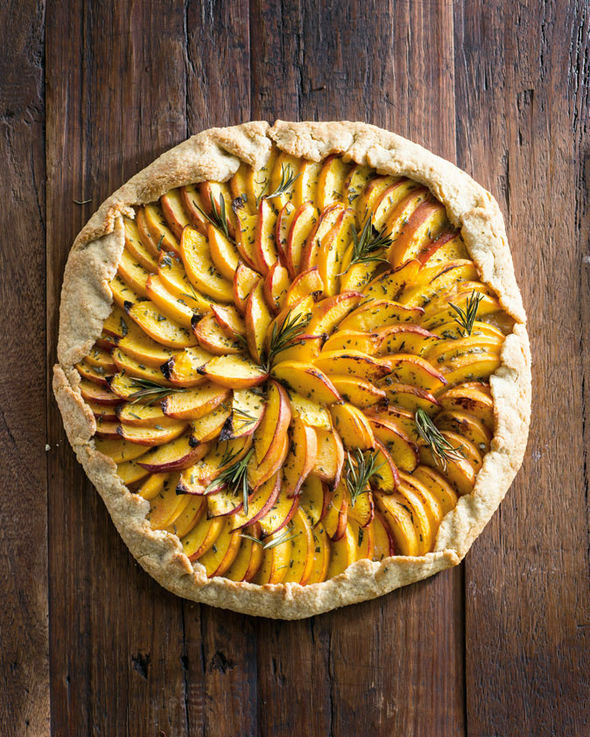 Place in a mixing bowl, sprinkle with the sugar, cornflour and rosemary and gently toss so the peaches are coated. Set aside until the dough is ready to use. When you take the dough out of the fridge, preheat the oven to 190°C/375°F/Gas Mark 5 and place a large baking tray inside. Roll out the dough between two sheets of lightly floured baking paper to make a 35cm circle. Carefully peel back the top layer of paper. Stir the warmed jam to loosen it, then spoon some into the centre of the dough and spread out with the back of a spoon, leaving a 4cm border. Add enough jam to make a thin layer. Sprinkle with the ground almonds, then arrange the peaches on top. Fold the pastry border inwards, pleating to form a neat edge, and brush with the egg. Remove the tray from the oven, slide the galette and baking paper onto it and bake for 30-35 minutes. Serve the galette warm with yoghurt.